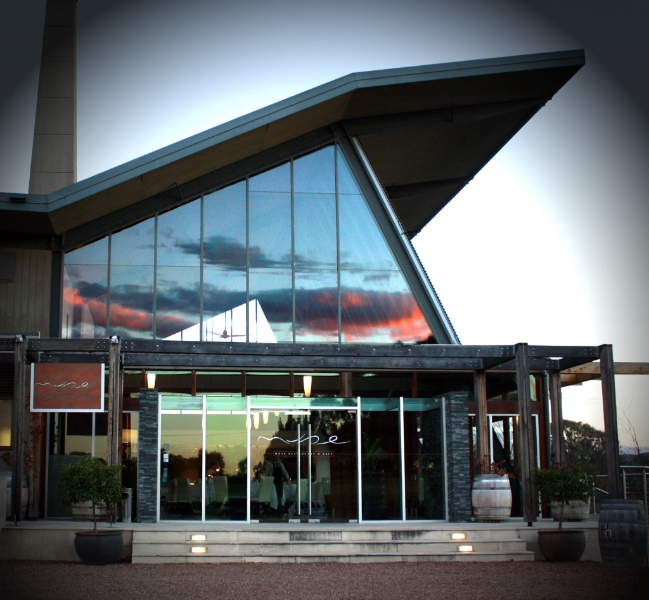 With this warm and welcoming introduction I could not resist a trip down to his restaurant at Hungerford Hill Winery when in the Hunter Valley. Australian freshest most local produce is one of the most enticing parts of visiting this country down under. Muse is housed in a bright room with glass walls, high ceiling and a flickering fireplace. The atmosphere is wintery, even if temperatures outside are still warm, despite being the middle of the winter. The walls are lined with thin stones and the roof is slandered, as if we were in the Alps. The kitchen busyness can be seen from our table and the air is filled with the unstoppable movement of the service staff at peak Saturday lunch hour. The restaurant is unpretentious and, based on the initial impressions, you do not feel you are in a multi award-winning fine-dining restaurant. But this changes as soon as the bread and butter arrive. 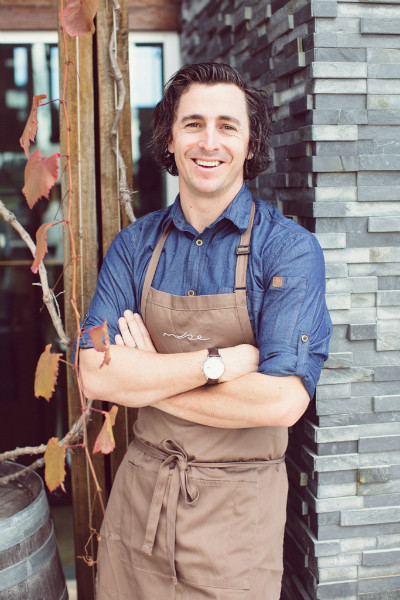 Chef Rhoades-Brown believes that it is essential for the staff’s training and t ensure consistency and quality that as many elements of the experience be made in-house. Breads, butters, pasta, are all made in the kitchen. It is no surprise that the bread is a first insight into the crew’s cooking skills. The garlic infused whipped butter is so light it feels like whipped cream and it could almost be eaten like a mousse. The bread roll, looking more like a cinnamon roll from one of the American chain outlets, is delicious. It is hard not to order more and more and simply fill your stomach before the food even arrives. But that would be a shame for the menu is as appetizing as the seasons. Opting for a two-course lunch I settle for the Sashimi of Hiramasa Kingfish with fennel, apple, its own verjuice and Coppers folly wasabi yoghurt as a starter and the Confit Petuna Ocean Trout with seaweed risotto, pickled daikon and broccolini. 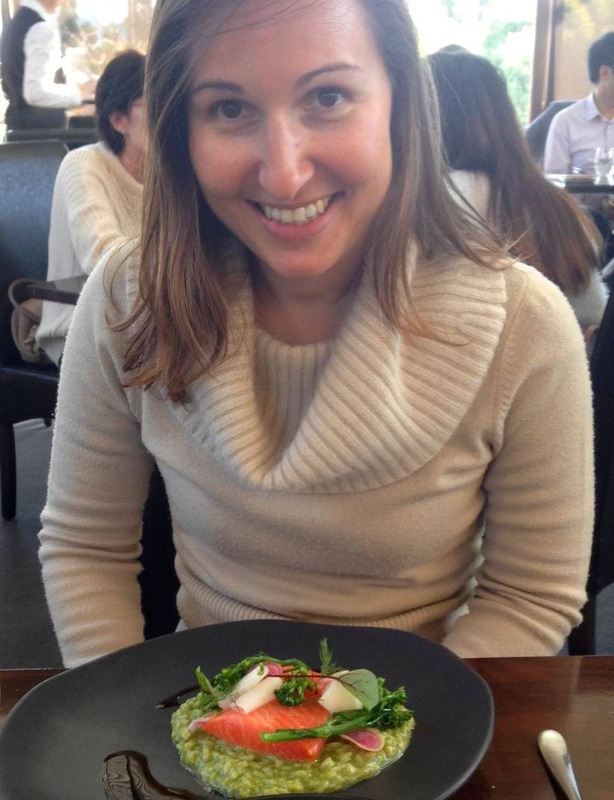 Both dishes were seafood, representing the proximity to the sea, and the time of the year. I wanted a light meal given the heavy wine morning we had and this was as fresh and refreshing as a lunch can be. The sashimi arrived beautifully presented, as most of the chef’s dishes are. The white of the fish was complemented with the green of the apple, fennel and the wasabi on a dark brown plate. It was so delicately laid out that it was almost a shame to eat. The wasabi yogurt came in the form of dry ice and liquid nitrogen adding a layer of sophistication and skill. Although all the ingredients were extremely fresh and a lot of work and patience went into putting it all together I found the dish to lack in flavor, a bit more seasoning would have further exposed and enhanced the natural beauty of the ingredients. My trout was as pure as only the best can be. The risotto was consistent and filling, which was necessary given the rather small portion of the starter, a great excuse to eat some more bread! The seaweed was subtle and added color and texture yet none of the pungent smell or taste. The colors on the plate were pretty but the plating of the fish on the bed of messy risotto did let it down a bit in terms of presentation, I was expecting something more refined. 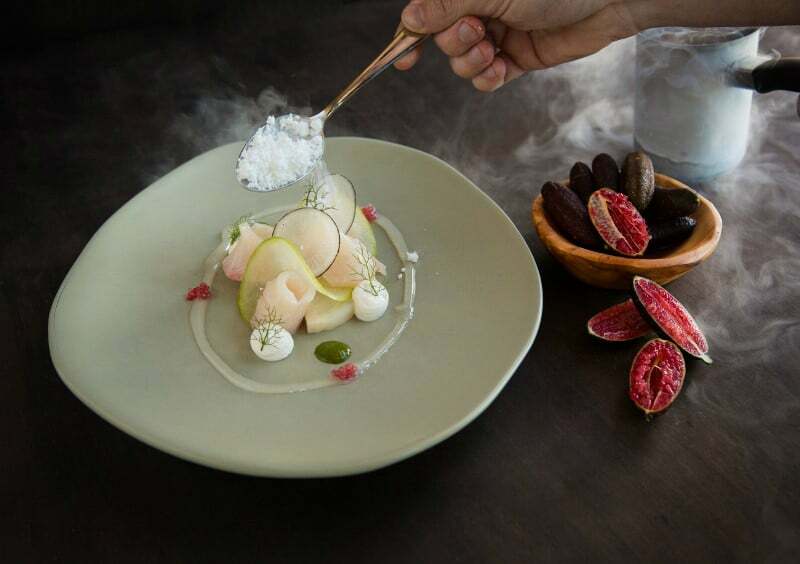 I regretted not ordering the famous Muse Coconut signature dessert, I had had too many excesses in the day and the previous week of Sydney’s indulgences to have the courage to add one more sin but you should definitively get to it. 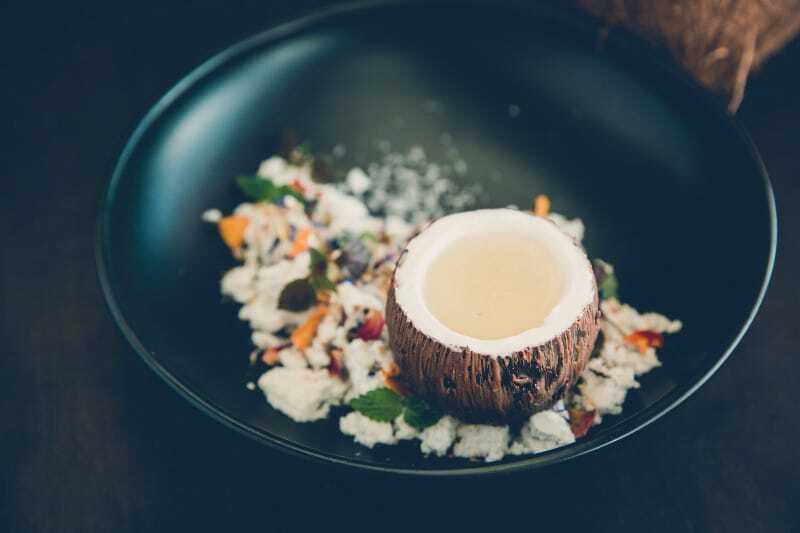 The Coconut is made of chocolate, resembling a real husk, and it is filled with coconut mousse, coconut water with vanilla and it sits on a bed of shaved coconut. Not only is this one of the most beautiful dishes you may ever see (I peered through to see another guest enjoying it), but also a divine combination judging by the many online reviews and ravings. Would I recommend Muse? Indeed. Would I return? Yes. But I would certainly make it for dinner, when the fireplace and winter, mountain ambience provide the perfect setting to spot stars through the high ceiling and when time allows to enjoy the full tasting menu which I am sure gives credit to the chef’s full skills and allows him to show everything he has.